Great Barwick’s least popular man is murdered on a train. Twelve jurors sit in court. Four suspects are identified – but which of them is on trial? This novel has all the makings of a classic murder mystery, but with a twist: as Attorney-General Anstruther Blayton leads the court through prosecution and defence, Inspector Fenby carries out his investigation. All this occurs while the identity of the figure in the dock is kept tantalisingly out of reach. 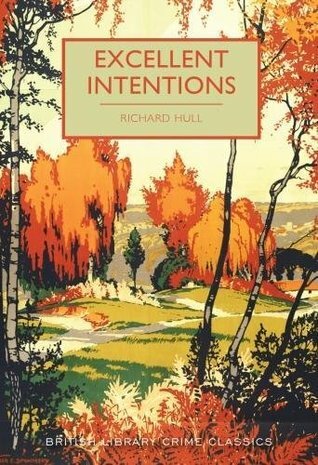 Excellent Intentions is a classic crime novel , first published in 1938. This book sounded interesting to me. I’m a fan of detective and crime stories, and this one seemed like a good one to try out. The cover also spoke to me, so autumnal. I didn’t know this author, and that he was a crime novelist from around the 1930’s. 1. Prosecution: The story started unclear in the beginnnig, then started to get exciting when we heard about the murder and the situation. Later in the chapter the story got boring again for me, and I found the chapter too long. 2. Investigation: A very long chapter, which got boring. 3. Analysis: This chapter is immensely factual. The facts of the case are stated in a list. 5. Summing up: I felt like I could have read this chapter instead of all the chapters before. I read This Bloody Project by Gaeme Macrae Burnet, which has a similar set-up. The setting up in this book wasn’t working for me. The chapters were very long and long-winded to get through. I couldn’t stay concentrated for a long time. Because of this, I skipped a lot of words and sentences. The case consists of only a few clues that I figured out. These couple of clues are all the story focuses on. It would have been more engaging if more clues were existing, perhaps interconnecting with each other in a clever way. Evident in this book is the lack of sympathy for the deceased. No one cares about the victim of this murder. This was interesting since most times someone would care about the victim, and this may be a motive quite some times. I couldn’t get into this book. Maybe if I would have been able to read it with more concentration, I would have been able to appreciate it more. Though that didn’t happen right now. This book get’s 2/5 stars from me, which makes it to the list of books I liked the least. Although a set-up of parts in this book may interest me a lot normally, I couldn’t find my enjoyment in this book. Let me know in the comments what you think.